The name says it all. 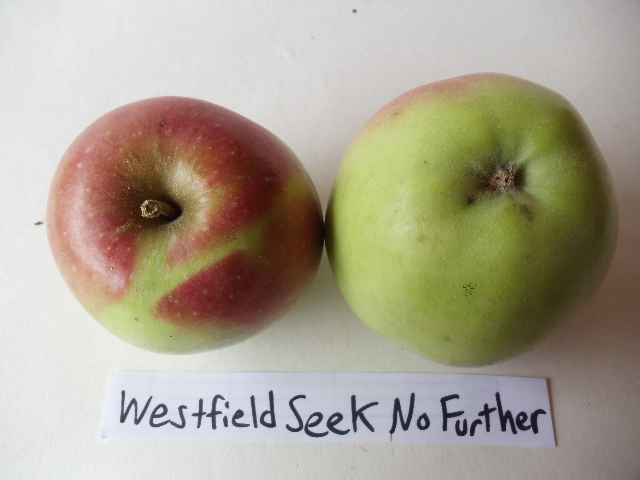 The person who discovered this apple growing in Westfield, MA in the mid 18th century must have known he (or she) had a winner. Its looks, utility and flavor make it a standout. The apple's deep yellow skin is covered with dull, rusty red, bright red and russet patches and streaks, carmine stripes, and yellow, grey and russet dots - a rainbow hanging on a tree. But you will remember this apple for its taste. In The Apples of New York Beech writes, “firm, medium in grain or a little coarse, crisp tender, breaking juicy, mild subacid, rich, sometimes astringent, peculiarly aromatic, sprightly, very good to best.” We can put it a bit more succinctly: WSNF is rich, a little sweet, a little sour - this apple has everything. Good for dessert and cooking, it is also an outstanding drying apple that develops more flavor as it dries.